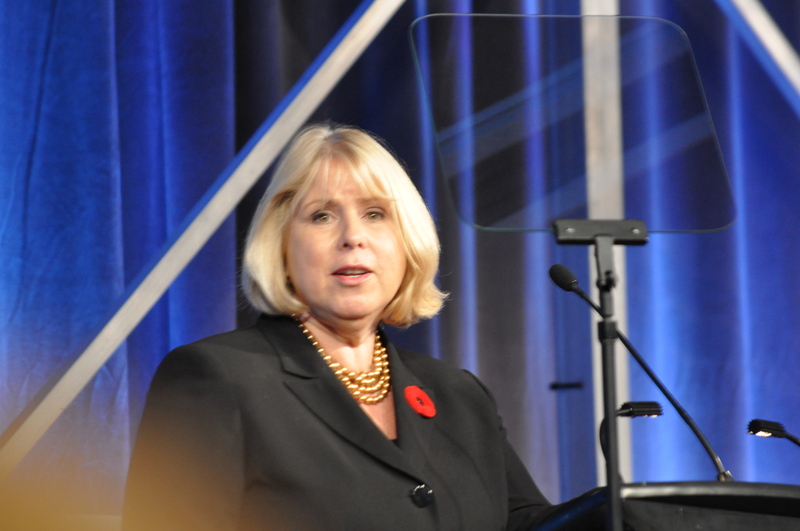 Health Minister Deb Matthews at the OHA HealthAchieve. “I want to tell you a story about Bernice. This is a true story. And I say thank you to the HNHB LHIN for this story. This is one patient’s story, Bernice. Only the name has been changed. Bernice lives at home. CCAC visits once a week and her kids are regular visitors. One day, she falls and gashes her arm. She calls the ambulance, goes to the hospital by ambulance. They fix her up, send her on her way. Her family doctor isn’t notified, and there’s no follow-up care. When the CCAC next comes, they’re surprised to that she’s been injured. A year later, Bernice falls again, and breaks her hip. Another ambulance trip to the hospital. She waits three days in the ER, then gets transferred to another hospital where she has surgery. She spends six months recovering in the hospital, and got MRSA. She sells her house and moves to long-term care. So you look at five years of care for Bernice, we spent close to half a million dollars. Now, we have to ask ourselves, did it have to be that way? Were we doing our collective best for Bernice? So let’s imagine what that journey could have looked like. Bernice lives at home. CCAC comes once a week and her kids are regular visitors. One day, she falls and gashes her arm. EMS comes, fixes her up right on the spot, notifies her GP on the spot and makes a geriatric assessment referral. Her children go with her to the appointment, and learn how they can improve Bernice’s functional ability. Bernice is enrolled in a falls prevention program, where she makes new friends and starts going to Bingo. One day, leaving Bingo, she slips and falls on the ice and breaks her leg. She is taken to her local community hospital. Staff there call the designated referral hospital. Bernice is transferred there, has her surgery right away, then is transferred back to the community hospital where she recovers. A week later, she is discharged to a transitional care program for a month. Then she goes back home, with on-going support to maintain her functional ability. This entry was posted in Uncategorized and tagged Bernice story, Deb Matthews, Integrated Health Care. Bookmark the permalink.